Camp Playland employs teachers, college students and high school students 16 years old and older. Camp Playland was started in 1957 and has always been operated by the Bloom family. This will be our 63rd summer serving children in Fairfield and Westchester counties. 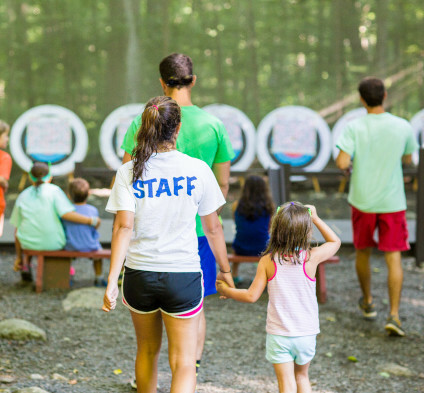 We enroll approximately four hundred campers and have a staff of one hundred and fifty counselors. The Playland staff is the key ingredient for a successful summer. For you to consider working at Playland you should be a mature, positive and energetic person, a role model and a mentor. You should enjoy working with young children and working outdoors at camp activities. Your enjoyment will enable the campers to have a wonderful summer. Working at Playland from Camp Playland on Vimeo. Camp dates for 2019 are Monday June 24th – Friday August, 16th. Working at Playland is a full 8 week commitment. Camp will be closed on Thursday July 4th. Staff orientation meetings are scheduled for June 2019 prior to the first day of camp. Please fill out and submit the job application. If a position is available you will be called for an interview.